There are several ways of diluting or mixing essential oils. For topical application, such as massage oil, chest rub or hair mask, essential oils should be diluted with a carrier oil to protect the skin and prevent adverse reactions. Simply defined, a ‘carrier oil’ is a substance used to dilute the essential oil and may be in the form of a butter, an oil or a lotion. There are a number of natural products that can be used as carrier oils, such as almond oil, jojoba oil and coconut oil. 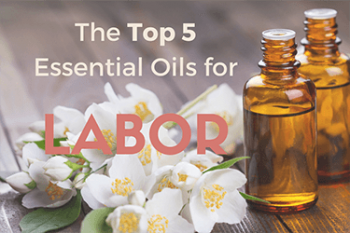 Each of these carrier oils may have additional moisturizing or therapeutic properties that make them uniquely suited for different applications. When choosing carrier oils for essential oils, users should consider the cost, shelf-life, and intended uses. While some carrier oils may be good for many applications, other may be more suited for particular ailments or sensitive skin. To achieve the best results, users should consider the properties of both the essential oil and the carrier oil to ensure they are complementary. In addition to topical use, essential oil combinations can also be diluted in water to create essential oil spray recipes which can help freshen a room, eliminate unfavorable odors, influence mood or improve breathing. Rather than buying expensive perfumes or room sprays that may be heavily loaded with chemicals, you can opt to make your own signature fragrance. Essential oils can also be diluted and added to a soothing bath. Depending on the essential oil, aromatherapy baths may help reduce stress, stimulate circulation, ease muscle tension or stiffness and help combat mental fatigue. 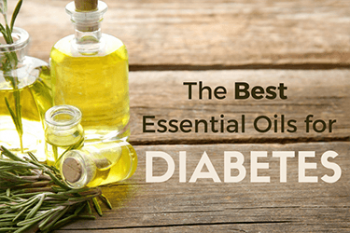 Users can dilute 2-10 drops of essential oil into 1 Tbsp. of carrier. This may include a natural bath gel or vegetable carrier oil. It should be noted that vegetable oils may make the surface of the tub slippery, users should exercise caution when entering or exiting. For users who would like to pre-make a large batch of diluted essential oils for future use, additional essential oil bottles and accessories can be conveniently purchased online. These items can also be purchased in bulk for users who wish to create large batches, or gift their homemade essential oil blends. Storing your essential oil creations in proper containers can help reduce the risk of oxidization and ensure a long shelf life. As mentioned, applying undiluted essential oil directly to the skin should always be avoided. It’s important to note that essential oils will need to be diluted to various strengths for certain populations, such as children, adults or pets. For those who are pregnant, nursing or have chronic health conditions, always consult a health care professional before beginning any aromatherapy. Often, essential oil blend recipes will call for different concentrations depending on the intended use. When making large batches, or adjusting recipes, this may cause confusion and lead to incorrect ratios. 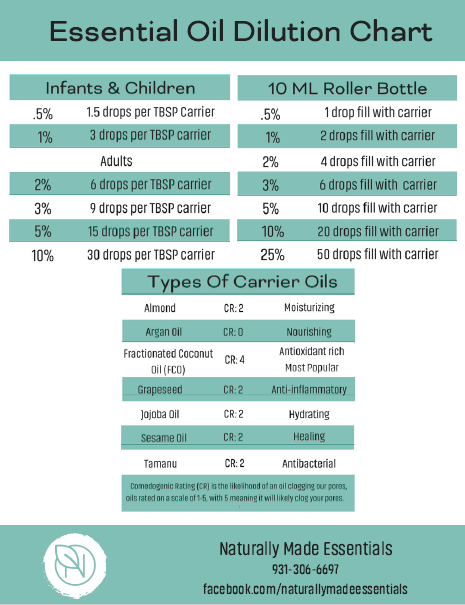 The guidelines below will help you determine the proper ratio of essential oils to carrier oils. Some aromatherapy experts suggest that for use on children under two years old, only dilutions of .5% or less should be used. On adults, for daily use and application for the entire body, users should maintain around 1% dilution of essential oils. Concentration can be increased to 5-10% for very small areas or treating specific ailments. When you are diluting essential oils, remember that 1 Tbsp is equal to ½ ounce, 3 Tsp is equal to ½ ounce, and 30ml is equal to 1 ounce.